The Island Poetographer VivaVoce: Sunbeam Chocolate Cake for Ms P's Birthday! It's Ms P's Birthday this week and in her honour Mr Bear dusted off the only homemade chocolate cake recipe we will ever bake: his mother's Sunbeam Mix Master one. (A cookbook was included with the machine back in the '50's). The kitchen has been smelling of chocolate cake all afternoon and it is a Very Good Thing that she is coming over tomorrow for lunch and will take it away with her. 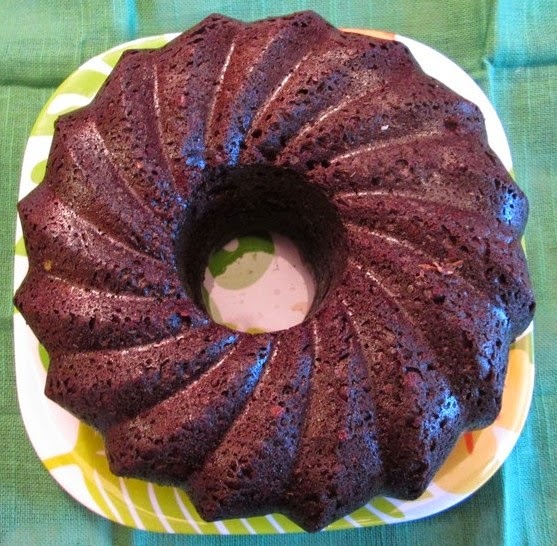 (either inside or out..lol) This is the first time Mr Bear has tried the silicone bundt pan and being a 'belt and suspenders' kind of cook, made sure it would not stick by spraying the be-heavens out of it before pouring the cake batter into its curvy recesses. As you can plainly see : TA DA! SUCCESS!! May your oven maintain the right temp!